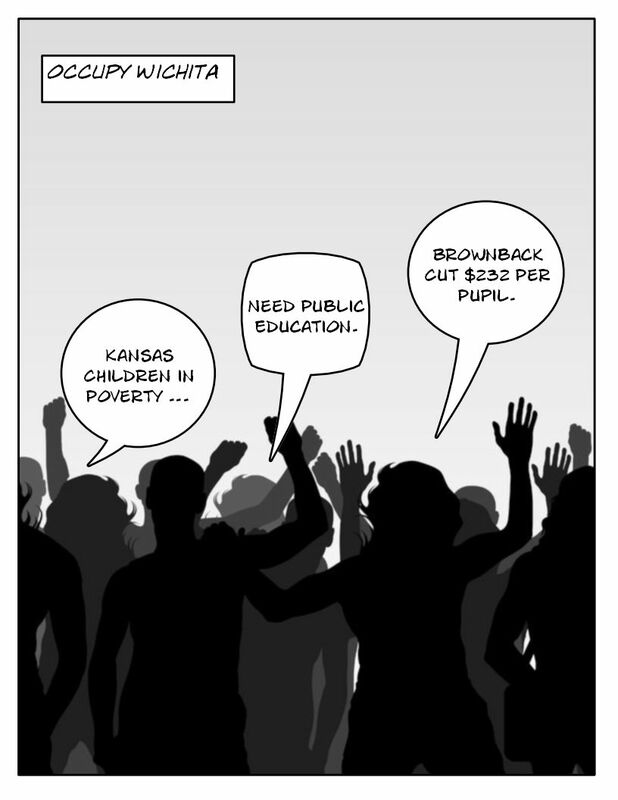 Occupy Wichita disrupted a town hall meeting sponsored by Kansas Gov. Sam Brownback yesterday. Among other issues, protesters spoke out on behalf of public education, criticizing the governor for slashing school funding. Police arrested one protester, who was later released. Reducing childhood poverty was the topic of the town hall meeting, and the speaker was Robert Rector, a senior research fellow with the conservative Heritage Foundation. According to Rector, the way to reduce the number of children living in poverty is to increase the number of married parents. He delivered a similar talk earlier this week in Kansas City, Kan., and another presentation is scheduled for this afternoon in Garden City. Kansas’ Department of Social and Rehabilitation Services is sponsoring Rectors’ speeches. Wichita police department records show that they arrested Gent yesterday at 3:40 p.m. and charged her with obstruction of justice and resisting arrest. On her Facebook page, Gent says she is not guilty of either charge and plans to seek legal counsel. I absolutely cannot support Brownback and his Catholic agenda. I heard him give the graduation speech for Benedictine when my daughter graduated in May. He bashed single parents. This single parent was ticked off!!!!! I have no respect for the man and what he’s doing to ruin public education in Kansas.